Actinic purpura is a benign clinical entity resulting from sun-induced damage to the connective tissue of the dermis. Actinic purpura is characterized by ecchymoses on the extensor surfaces of the forearms and the dorsa of the hands that usually last 1-3 weeks. See the image below. Actinic, or senile, purpura. Courtesy of José Reynaldo da Fonseca (own work), via Wikimedia Commons. Bateman  first described the condition in 1818 when he noted dark purple blotches and determined that they were due to the extravasation of blood into the dermal tissue. Hence, it is sometimes called Bateman purpura. It is common in elderly individuals and usually occurs after unrecognized minor trauma to the respective areas. Notably, no inflammatory component is found in the dermal tissue. The absence of a phagocytic response to the extravascular blood has been postulated to be responsible for delaying resorption for as long as 3 weeks. Actinic purpura may be, along with osteoporosis, a sign of collagen loss in skin and bone. This causal loss of skin collagen has been confirmed when collagen was expressed absolutely, instead of as a percentage or ratio. That is, women have less collagen than men and it decreases by 1% a year in exposed and unexposed skin. These changes in skin collagen may correspond to changes in bone density. The hypothesis is that the changes in skin collagen also occur in bone collagen, leading to the associated changes in bone density. Actinic purpura is an extremely common finding in elderly individuals, occurring in approximately 11.9% of those older than 50 years. Its prevalence markedly increases with years of exposure to the sun. A study of the prevalence of dermatoses in 75 elderly residents in a long-term care facility in Santos, Brazil, found 280 dermatoses, with an average number of 3.73 per elderly person and 32 different types of dermatoses. Actinic purpura was evident in 29.3% of them. The effects of chronic sun exposure with the resultant ultraviolet radiation–induced skin changes occur more often and are more pronounced in fair-skinned individuals than in others. Actinic purpura occurs almost exclusively in the elderly population, though it may sporadically occur in younger people. The incidence varies with respect to age. Approximately 2% of those aged 60-70 years and as many as 25% of those aged 90-100 years can have the purpuric lesions. Individual lesions of actinic purpura generally resolve within 1-3 weeks. Residual hemosiderosis may occur. Purpuric lesions usually continue to occur during the individual's life. The ecchymoses may be cosmetically distressing and may leave dyspigmentation or scarring, but the lesions are not associated with any serious complications. Reassure the patient that this condition is benign. Emphasize the absolute necessity of using sunscreen and barrier protection to prevent further photodamage. Inform patients that sunscreens do not reverse photodamage. Instruct patients to minimize any trauma to the skin where the purpuric lesions are present. Bateman T. Exanthemata. A Practical Synopsis of Cutaneous Diseases. London, England: Longman, Hurst, Reese and Brown; 1818. 118-9. Kaya G, Saurat JH. Dermatoporosis: a chronic cutaneous insufficiency/fragility syndrome. Clinicopathological features, mechanisms, prevention and potential treatments. Dermatology. 2007. 215(4):284-94. [Medline]. Karadag AS, Parish LC, Lambert WC. 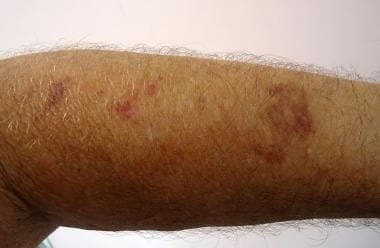 Senile Purpura as a Stage of Dermatoporosis. Skinmed. 2017. 15 (2):91-92. [Medline]. Borroni RG, Grassi S, Concardi M, Agozzino M, Caspani C, Giordano C, et al. Involvement of dermal microvascular basement membrane in senile purpura: quantitative immunohistochemical study. J Eur Acad Dermatol Venereol. 2015 Sep 25. [Medline]. Humbert P, Fanian F, Lihoreau T, Jeudy A, Pierard GE. Bateman purpura (dermatoporosis): a localized scurvy treated by topical vitamin C - double-blind randomized placebo-controlled clinical trial. J Eur Acad Dermatol Venereol. 2018 Feb. 32 (2):323-328. [Medline]. Shuster S. Osteoporosis, a unitary hypothesis of collagen loss in skin and bone. Med Hypotheses. 2005. 65(3):426-32. [Medline]. Lewin GF, Newall N, Alan JJ, Carville KJ, Santamaria NM, Roberts PA. Identification of risk factors associated with the development of skin tears in hospitalised older persons: a case-control study. Int Wound J. 2015 Sep 24. [Medline]. e Dinato SL, de Oliva R, e Dinato MM, Macedo-Soares A, Bernardo WM. [Prevalence of dermatoses in residents of institutions for the elderly]. Rev Assoc Med Bras. 2008 Nov-Dec. 54(6):543-7. [Medline]. Waters AJ, Sandhu DR, Green CM, Ferguson J. Solar capillaritis as a cause of solar purpura. Clin Exp Dermatol. 2009 Dec. 34(8):e821-4. [Medline]. Jafferany M, Bhattacharya G. Psychogenic Purpura (Gardner-Diamond Syndrome). Prim Care Companion CNS Disord. 2015. 17 (1):[Medline]. Carlson JA, Chen KR. Cutaneous pseudovasculitis. Am J Dermatopathol. 2007 Feb. 29(1):44-55. [Medline]. Rubegni P, Feci L, Pellegrino M, Fimiani M. Photolocalized purpura during levofloxacin therapy. Photodermatol Photoimmunol Photomed. 2012 Apr. 28(2):105-7. [Medline]. Wood BA, Leboit PE. An 'inflammatory' variant of solar purpura: a simulant of leukocytoclastic vasculitis and neutrophilic dermatoses. Pathology. 2013 Aug. 45(5):484-8. [Medline]. Hardy CL, Glass JS, Sorrells T, Nicholas LC. Hemorrhagic Panniculitis Caused by Delayed Microemboli From Intravascular Device. JAMA Dermatol. 2014 Oct 1. [Medline]. Northcutt AD, Tschen JA. The routine use of iron stain for biopsies of dermatoses of the legs. J Cutan Pathol. 2014 Feb 12. [Medline]. Lipozencic J, Bukvic Mokos Z. Dermatologic lasers in the treatment of aging skin. Acta Dermatovenerol Croat. 2010 Sep. 18(3):176-80. [Medline]. Tattersall RN, Seville R. Senile purpura. Q J Med. 1950 Apr. 19:151-9. The authors and editors of Medscape Reference gratefully acknowledge the contributions of previous author, Vinay Arya, MD, to the development and writing of this article.